Listed as Edward Hallagian, nephew of Samuel Hallagian, head of household. See Eddie's naturalization card here! 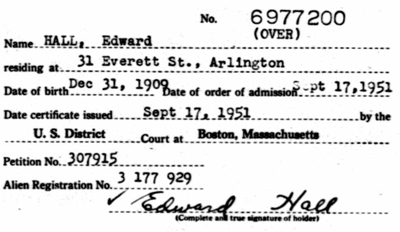 Listed as Edward Hall, birthplace: Turkey; he had completed two years of college. Yera and Mithran Halladjian with their two sons, Yarvant (Edward M. Hall) and Puzant (Raymond Hall). Yera and Mithran Halladjian with their two sons, Yarvant (on the left Edward M. Hall) and Puzant (on the right Raymond Hall). [S311] The Hauenstein & Schifferly Families of Ohio, Pg 480. [S86] ua, Arlington, Middlesex, MA ED 9-170 Page 14A Dwelling 274. [S449] 1940 United States Census, 1940 United States Census., Arlington, Middlesex, Massachusetts, ED 9-24, Page 1A, Dwelling 11. [S86] ua, National Archives and Records Administration (NARA); Washington, D.C.; Index to Naturalization Petitions and Records of the U.S. District Court, 1906-1966, and the U.S. Circuit Court, 1906-1911, for the District of Massachusetts; Microfilm Serial: M1545; Microfilm Roll: 59.